When tablets burst onto the scene in 2010 with Apple’s iPad, nobody thought they would affect the children’s market in anyway. I mean, it seemed ludicrous to give a sticky fingered toddler a brand new high end device with its notoriously breakable screen. And yet, for that much sought after ‘peace’, parents are shoving tablets in front of their children in their millions, it would appear to be the equivalent of the babies dummy. This change in parenting has resulted in the rapid growth of the children’s application market. It has even led to companies specifically targeting children with Samsung, Kurio and LeapFrog all taking the initiative in this new market with a new tablet. This also means that mobile developers for iOS and Android have a whole new market to learn and exploit. Present day, well known children brands and start-ups alike are competing as they try provide the best educational apps with enough interactivity and fun to keep children interested for more than 5 minutes (Read more about the profitability of iPad applications). The general consensus by industry experts is that education will slowly become more digitalised and the use of educative applications continue to rise. Some early studies suggest that the high interactivity and interest generated from ‘playing’ an educational app in fact increases learning among users. Here are some examples of excellent current educational apps. As the name suggests this application was designed as a basic maths learning application. Throughout the game you fly round space solving basic maths problems. Thanks to the 7 mini games it offers, children can learn several different maths topics and skills while encountering, flowers, cheeky monkeys and planets. The different games and maths topics covers; counting, comparing, geometry, number recognition, patterns, measuring, and sharing. All games are easy to understand but if a child is stuck the app offers the availability of hints. The application uses positive reinforcements to ensure the child doesn’t get bored or frustrated with the problem solving, in fact if a child gets all questions wrong it still praises them for their effort. The Application is advertising free as you would expect from a paid app and offers good value for money compared to its competitors, due to the variation it offers through its mini games. 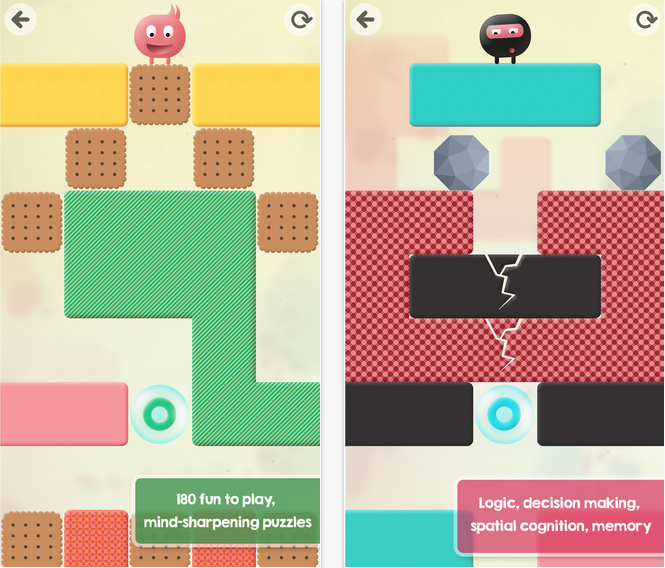 Thinkrolls is a cute and addictive game for the 3 to 8 age bracket. Thinkrolls allows the player to choose from 18 loveable ball shaped characters to explore the various mazes and challenges. There are 7 chapters each designed to subtly teach the basics of physics, through the induction of fire and ice, balloons, jelly, rocks, gears, wooden crates and all properties that accompany them. For example, crates help teach gravity, rocks introduce the concept of density and falling speed and so forth. The game is also split into easy and hard levels, recommended for 3 to 5 and 5 to 8 year olds respectively. On top of all that there are 10 different levels per chapter for them to master and enjoy. There aren’t many apps out there to rival it as Thinkrolls manages to incorporate physics and fun, which could be deemed a success in itself! Also there is a parental lock, stopping children from accessing other apps and parent content. KidQuest promotes scientific principles in a fun and experimental learning manner. The app offers a wide selection of craft, science and activity ideas. The app can be enjoyed from the ages of 4 to 11 with various crafts and experiments. This app is different as it actually encourages children to put down the tablet and go out and complete the various tasks. If you’re searching for an app that will educate and keep your child occupied for hours then this might be the perfect app. The various activities can be completed individually, with a group of friends or as a family. Every time an activity is completed a record is automatically kept in an app scrapbook. You’re also encouraged to add content to this such as, pictures , writing notes and videos. This can be a very creative tool and it is useful to see the progress you’ve made. Even if you don’t add any content it automatically inputs a simple step by step process of the activity. KidQuest also rewards its users with a badge every time an activity has been completed. With over 20 activities which are fun to play over and over this app provides great value for money. There is also the option to purchase further quests, ranging from $0.99 – $1.99. Why Should you Invest in the Development of iPad Applications? How to use Your Smartphone?